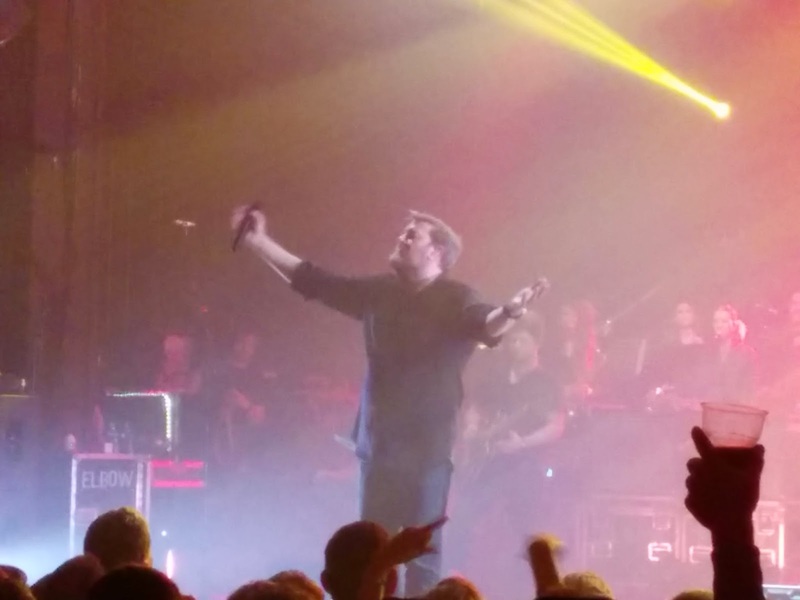 Last time we saw Elbow was in the cavernous expanse of the Manchester Arena as they performed tracks from their last three albums. Whilst we love those records, we were less impressed by the lack of earlier material and the showman antics of Guy Garvey. This set of four hometown gigs at the Apollo has been heralded as a return to their roots and a career retrospective. We weren't left disappointed by what we heard and saw. Elbow's career trajectory has been an interesting one. Starting back at the tail of the last century, they were signed to Island and dropped before releasing anything. They ploughed on with local indie Ugly Man before being picked up by V2 who released the Mercury nominated debut Asleep In The Back. Things didn't go quite to plan commercially with follow up albums Cast Of Thousands and Leaders Of The Free World despite those albums garnering adulation from their fanbase. 2008 saw a change in fortunes as the almost forgotten men released their classic The Seldom Seen Kid, which won the Mercury and saw them hailed as heroes of the British music scene. Albums since then Build A Rocket Boys and The Take Off And Landing Of Everything cemented that place, but led to accusations from some elements of the fanbase that they'd forgotten their roots with setlists focusing solely on those last three albums and The Seldom Seen Kid in particular. This tour featuring four sold-out nights at Manchester Apollo and three at Hammersmith was touted as a look back at their career as well as a size-down on the arenas that they've been frequenting for the past few years. Frenzied internet chatter greeted snippets and teasers the band had been putting out there, building the excitement about a return to some of the crowd favourites from the early albums and Elbow didn't let us down. Last time we saw them we were swept up in a tidal wave of love for the music, the beautiful hushed arrangements of last year's The Take Off And Landing Of Everything soothing and caressing thousands in the arenas combined with the unadulterated majesty of the songs from The Seldom Seen Kid. We wanted a more varied setlist, but once they started playing those songs, we were beaten. We were less impressed by the between song antics of Guy though, taking the reputation of the affable lovable uncle a bit too far. There's no such worries tonight though. 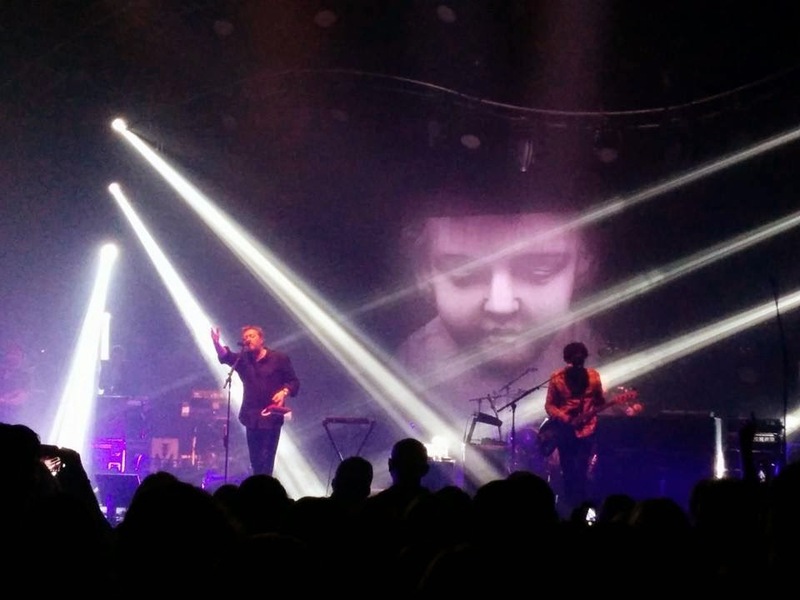 The show feels like Elbow have taken a step back from the brink. They mix songs from throughout their career - with three songs from Asleep In The Back showing just how different, and much darker a band Elbow were back then. Any Day Now and Newborn were singles at the time and part of what created that initial buzz about them - tonight, they, and fellow album track Bitten By The Tailfly, create a wall of noise that your average Elbow gig-goer wouldn't expect having been weaned on a diet of strings and lush arrangements since 2008. They fill the cavernous hall with these sounds and they don't feel out of place in the slightest. And whilst you might think the crowd could lose interest, they appear to love it. True, there's not the reception the opening bars of One Day Like This, placed half way through the set tonight and free from the shackles of everyone knowing it's at the end, and Grounds For Divorce get, but that's to be expected. There's nods in the set to other albums too. Fugitive Motel, the dreamy soundscape that previewed Cast Of Thousands, was a prototype for what was to come later, Garvey's emotive Northern man sensitiveness cast to the vast expanses of music and space created by the other four. There's the upbeat tale of jealousy and self-doubt that makes Mexican Standoff an urban hymn for sensitive men of a certain age the world over. When they start Macgreggor, a b-side laden with drums and staccato rhythms, preceded by a tale about Guy finding a statue whilst nipping into the bushes to relieve himself, it'd be hard to put them in the same place as the arena fillers that sit elsewhere in the set. It isn't just about celebrating that past though. We get the staples from The Seldom Seen Kid such as the aforementioned One Day and Grounds, but it's Bones Of You with the string section's extended take on Gershwin as the outro that steals the show from that record. Build A Rocket Boys, probably their poorest album, is represented by the highlights of that record, The Birds and Lippy Kids, which is played to almost silence and respectful reverence from the crowd. What's brought into contrast though by the range of songs they play is just how well The Take Off And Landing Of Everything fares against the other material. From opener This Blue World to the majestic coupling of Fly Boy Blue / Lunette to the unabashed love of Real Life (Angel) these rank amongst the finest of Elbow's canon. They finish the set and the encore with the album's title track and My Sad Captains respectively and neither feel inappropriate. As for Garvey, he's far more reserved tonight than we've seen him for a long long time and, as a result, when he tells us that the audience singing back on One Day Like This, we believe him, when he asks us to wave our arms from side to side for My Sad Captains, most of the audience do, because we haven't been asked to for every single song. He is one of the most genuine engaging front men out there, but far more so when he doesn't make the effort and is himself. Thankfully, there's no request for mexican waves as there was at the arena last time and he still has us eating out of the palm of his substantial hands. Elbow are back with their people. It was a close call at points, but tonight was about them falling back into the bosom of those that love them for everything that they are rather than what they think they needed to be. Elbow's official website can be found here. They are also on Facebook and Twitter.